CHDResources is committed to helping those with congenital heart defects reach their potential by providing important resource materials. We have created a set of FREE materials for physicians to distribute to patients, or for parents to download themselves. All materials can be customized to include physician contact information and personalized for each patient. To view the list of materials, see the Handouts/Forms page. Why do we provide these materials for free? 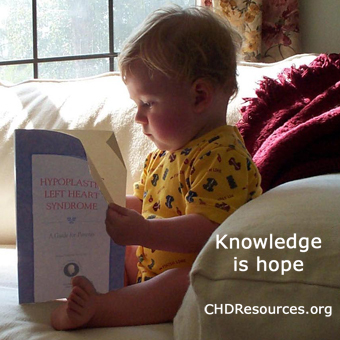 Because as parents of children with CHD, we truly believe that “Knowledge is Hope.” These materials help parents understand the many issues associated with having a child with a complex congenital heart defect, give them a starting point in asking questions, and gives them confidence that they are not alone. California Heart Connection, a nonprofit, all-volunteer support network. Copyright 2002-2013 California Heart Connection. All rights reserved. Read our latest article published in Pediatric Cardiology, based upon our nationwide survey of parents.